Eventually, men will realize that they are travelling together on a journey of Self-discovery, one which will bring them in time to the feet of the most holy. The essence of this journey of discovery is that it is self-enacted and willed, and at the same time is shared by all members, known and unknown, of the human family. True it is that all men are brothers, sons of the One Father, each engaged, consciously or otherwise, in this momentous adventure we call life. To many today, unfortunately, this adventure is a painful and degrading experience; to millions, it is unjust and barren, the sooner over the better. Small wonder is it, therefore, that so many see life as drudgery and grind, their child-engendered dreams of achievement and happiness but distant memories. Men are born to create and grow in Self-awareness, and need the environment in which that becomes possible. The terrible disease of commercialization has robbed countless millions of their birthright and, as its insidious growth encroaches on all aspects of men's lives, its tentacles of disaster squeeze every generous and human feeling from their hearts. Humanity is in thrall to commercialization and in peril of its soul. What can men do to reverse this process of disaster? Already, the current economic and financial chaos, symptoms of the destructive forces of commercialization, are showing men that they can no longer allow this monster to rule their lives; that they must take stock and assess anew their priorities for a more just and healthy economic structure which will the better serve their needs. There are, of course, many, relatively untouched by the current crisis, who see this time as a 'downturn' and look forward in full confidence to the inevitable 'upturn', when we can carry on as before. This is no longer possible; the blind can no longer lead the blind. They know not of Maitreya. Maitreya has chosen this moment to fulfil His promise to enter the domain of men and to help them on their journey. He is emerging now; His herald, the star-sign of His emergence, is seen worldwide by many and is the signal of His appearance, openly, before men. Using the television resources of today, He will engage on a series of interviews starting in America and including Japan and many other countries. As an ordinary man, undeclared as Maitreya, He will speak for all those who have no voice, no spokesman. He will call on men to share the goods of the Earth and to embrace each other as the brothers and sisters they are. He will show that if we would have peace there is only one way to achieve it: that is by the realization of justice throughout the world, and that justice can only be achieved through sharing. We await the response of all men and women of goodwill in this, our world. Q. The 'star' that can now be seen in several places around Norway, seems to get brighter and brighter all the time. Lately it has also been seen during the daytime. What then is its purpose? A. It is a 'sign' to herald the emergence of Maitreya into His public mission. Q. (1) Will the star be visible during the day when the sky is overcast? (2) Has anyone seen it during the day? (3) Where in the sky should we look if we are in New Zealand? A. (1) It depends on the thickness of the cloud cover. (2) Yes. We have reports from Norway, the USA and South Korea that the star is often visible during the day. I have no doubt this is repeated elsewhere. (3) In the west. Q. Was Maitreya present at all the marches for peace in Gaza around the world in January 2009? A. No, He was present at three marches. Q. A lot of people are saying that the new President Barack Obama, is Maitreya. Some question and answer sessions with Benjamin Creme infer Maitreya and Obama are two different people but that Obama may be especially open to Maitreya's ideals. Yet the most recent press releases advertising the emergence of Maitreya, his public talks about the economy and world ills sure tie in neatly with the emergence of the new President who is also talking about these same things. It is very easy to see why Obama is being seen as Maitreya by some people. Could you comment please: (1) is Obama actually Maitreya ? Or (2) just inspired by Maitreya ? A. (1) No, Mr Obama is absolutely not Maitreya. (2) I doubt that Mr Obama has ever heard of Maitreya. He may well be inspired by the ideas which have emanated from Maitreya over the years. These have been articulated by Share International for many years and are now being repeated by more and more people as the economic crash, predicted by Maitreya long ago, becomes a reality. Maitreya has waited until now to come forward openly because only now has the impending crash come to fruition, thus bringing many people – one of them, hopefully, Mr Obama – to see the reality of the need to change direction. Q. I am very grateful for the knowledge and wisdom Share International puts at the disposal of the public. I appreciate it very much. I have a question about the new President of the United States of America. He shares almost all the principles Maitreya is teaching. He seems to be not an ordinary person. (1) Is he one of the members of the Spiritual Hierarchy which will accompany Maitreya in his Mission? Or (2) Is he a channel Maitreya uses to fulfil His mission? He is leading the world in a new direction: sharing, co-operation, peace. Please tell me something about him. A. (1) At the moment there are 14 Masters in the world with Maitreya; eventually there will be around 40 Masters in the world. Mr Obama is not one of them. Nor is any man you are likely to know or have heard of. (2) Nor is he a 'channel' used by Maitreya for His mission. Mr Obama is unusual at this time in American politics: the first African American for a start; he seems to have ideals closer to the real needs of the people of America and the world in general; he seems to be ready to listen to the ideas of other nations and to be less involved in creating 'the American Empire', in short, a breath of fresh air in international politics. This is very important because the USA is so influential – for good or for ill – in the world. The questioner mentions sharing as one of his ideals but I have yet to hear him mention the word. That will be a major test, and the American people's, of his ability to respond to the basic tenet of Maitreya's teaching and advice. Without sharing there will never be justice. Without justice there will never be peace. Sharing is the key to the future for humanity. Q. Lord Maitreya admonishes us to share – and I want to share by giving (or tithing) to bona fide charitable organizations. Yesterday alone I received mail from eight charitable organizations seeking donations. I wish to give, and when I do, most likely they sell my name and then I am inundated with even more such mail. These places must have fairly big operating budgets if they can afford such mass mailings. People are dying of hunger every day, where the umbrella of no big charitable organization can reach them. Can Share International publish the names of viable, trustworthy groups who really are trying to feed the poor and shelter the homeless anywhere in the world, but who don't have the funds for mass mailings? I'm sure many readers would benefit from this information. A. Maitreya is talking about the global sharing among all the nations but, of course, this can only happen when the majority of individual people see the necessity and want to share. There are many bona fide aid agencies in the world, both independent and allied to the United Nations who do wonderful selfless work in helping the impoverished majority. Many people are rightly concerned that their aid actually reaches those in need but nothing is perfect and there is much corruption in the governments of the countries often in most need. Corruption is worldwide in the rich and poor alike. So the UN aid agencies, Oxfam, Christian Aid; Medecins Sans Frontiers; Save the Children etc, etc, will all do their best. Q. Is it possible to believe that humanity, in a short span of time, will create world and universal peace? That we will stop producing arms … can we hope to see this day, shortly? A. There is certainly a very large decision to be made by humanity when we are faced with it, and there are many reactionary forces in the world resistant to change. War and the production of armaments is a very lucrative business for some people who will resist change to the last. The present world economic collapse (presented as a 'downturn' or 'recession') is in fact the signs of the end of the old order, and is already bringing about a change in attitude among many people, young and old. When these same people hear Maitreya speak of the need to simplify and share resources to attain peace through justice, they will respond willingly to His call. His teaching and advocacy will inspire a huge response of desire for sharing, justice and thus peace. It is up to ourselves, we have to want peace enough to relinquish the past and work for the one humanity. I am sure we shall do so. Q. When it comes to helping Maitreya to fulfil his mission, which would include all religions, what about those that have a guru? When someone is following another Master or Guru how can this be combined? A. Maitreya is not a religious teacher. He is essentially a Spiritual Teacher including a concern about the political and economic and social needs of the world. He is the World Teacher, for all people, religious or not. Most people tend to see the religious path as the only spiritual path. It is only one of many paths to the experience of God. We have so enshrouded politics and economics in a deep materialism that we have landed ourselves in the critical conditions of today. We must have spiritual politics and economics through sharing, justice and freedom for all people. That is the aim of Maitreya. Love is the action of just sharing. That is the way to peace. No one need even believe in the reality of Maitreya. It is enough to believe in what He stands for. He does not want followers or devotees. Q. You have talked about the role of crop circles and energetic nodes around the Earth. Is it accurate to say the circles of light phenomenon is part of this same preparation for the Technology of Light? In other words, are circles of light urban crop circles? A. It is true to say that the circles of light phenomenon is part of the preparation for the Technology of Light. But it is not true to say that they are urban crop circles. They have a completely different function. Q. What is that function? A. If I could tell you what that function is, I would not be sitting here. I would have the scientists of the world all sitting at my feet wanting to know what it is. If I did know, there is no way I could impart it to you. The answer is I do not know. But what I do know is this: that if we understood the technology that created the circles of light phenomena we could rid the world of global warming in a very short space of time. Q. I fear for the grief I will have to deal with when my sisters or my parents go to the astral plane. I will miss them terribly. I comfort myself by saying: "I will see them again when I go there myself." However, what if they have incarnated back on the physical plane again before I have had a chance to see them? Will I be doomed to never see them again? Can you help me with this? Please be compassionate in your response. A. Don't despair, we incarnate in groups, changing relationships again and again. You could be the father of your parents and sisters or in some other relationship. So don't worry. Q. You said in one of your books to get "in touch with the soul". How, practically speaking, do you do this? A. The age-old way, by meditation and service. Q. In April 2008 my mother passed away at the Cranbrook hospital in British Columbia, Canada. While she was in her room my wife and I walked outside for some air. While we were sitting there, a cross in the sky formed directly over the hospital. I don't know who else saw this cross that day but there were no other clouds in the sky. I wish to God that I had my camera. I would hope if anybody else that day saw this incredible sight they would verify what we had seen. I truly believe that this was a sign from God. A. The cross in the sky was manifested by the Master Jesus. Q.I read in Share International that we could practice the principle of sharing in our own business, simply by dividing the profit into equal parts. I would like to confirm this once more, since I prefer to apply this principle in my own circle and business. I realized that whatever individual qualification or contribution had been made, the equal parts of the profit should be shared. Am I right or not? A demonstration in aid of the Palestinians in Gaza was held on 24 January 2009 in London. Protestors gathered outside the BBC (British Broadcasting Corporation) who had refused to broadcast an appeal from the Disasters Emergency Committee for Gaza. I was carrying a banner with a co-worker in a packed crowd of marchers when suddenly I noticed a young child with blond curls, laughing merrily, running and jumping in and out of the demonstrators. The mother, tall, young and fair-skinned, with dreadlocks down to her hips, followed a little later, smiling happily. My spirits lifted and I laughed. They disappeared among the crowd. I looked out for them and saw the young woman holding the child in her arms. She was standing on the broad pavement, balancing a large, pink, heart-shaped banner. It had bold white letters which read: 'LOVE IS ACTION'. On the back was written: 'CHANGE CAN ONLY HAPPEN IF YOU ACT'. The demonstrators swept on, taking me with them. I didn't see them or the banner again. Would you kindly confirm if they were really Masters? Something strange happened to me on the night of 8 February 2009. I was very sceptical about the information of the star sign and began wondering if it wasn't all just an illusion. I began to think what would happen to the world if Maitreya wasn't here? It would probably mean the destruction of the entire human race and the planet. I was very sad and depressed and went to my bathroom to take a shower. I turned on the shower and when the steam began to fill the bathroom I noticed that on the bathroom mirror was a handprint. It resembled the 'Hand' of Maitreya. I hadn't touched the mirror before, so I was very shocked, but the sight of the handprint recovered my strength and I was filled with joy, calm and hope again. Was this manifested by Maitreya? I organize art and craft events and in October 2008 I ran an event about wooden crafts. As the public started to arrive for the show a man walked in and said to me: “Don't look so worried.” My worried look probably turned into a baffled look as I couldn't recall seeing the person before. After that he came up to me and asked me if I was going to treat him to a cup of tea. At this point he held my hand. I remember the energy flowing through his hand. Unusual as this situation was I didn't recoil as his energy didn't make me uneasy and almost acted as a pleasant sedative. He explained that he knew some of the woodturners taking part in the show very well. Also that they had tried to talk him into taking part. But the thought of going into his workshop and getting down to turning some work didn't really appeal to him. I discussed with him the different events that I organized at the hall and he seemed interested. He had collected a leaflet and asked if I was a member of the guild it was advertising. He then went to walk around the show. It seemed quite some time afterwards, while I was talking with a couple I knew, that he returned and said he was glad to have met me, bid me goodbye and went on his way. I would like to add that this show seemed special, as did other craft shows organized at the hall. Craftspeople have commented that there is a good atmosphere and that they have really enjoyed taking part. Because the shows are essentially uncommercial, and more about creativity, I have noticed sharing, goodwill and a sense of group work is very apparent. The show was busy and I met many people that day. It was only afterwards as my mind ran through the day's events that I again puzzled over the man and concluded that perhaps I really should have treated him to a cup of tea. Please can you tell me who the man was: was he a Master? C. E., Hullbridge, Essex, England, UK. 'Education, education, education' was the theme of Benjamin Creme's keynote talk at the US and European Transmission Meditation Conferences in 2008. 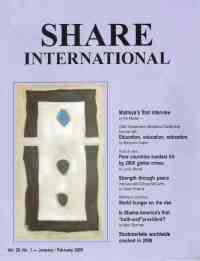 The talk and the European Conference Question and Answer session were published in Share International January/February 2009. Excerpts from the Question and Answer session from the US Conference follow. Q. Which of the Alice Bailey books do you recommend in relation to the new education? A. I would highly recommend Education in the New Age. Then Initiation, Human and Solar. Then if you have a weekend free, A Treatise on Cosmic Fire! Then the books on the rays, esoteric healing, esoteric astrology. Go through them all. All of them are educational. They are given to stimulate the mind and intuition, and awaken you to levels of yourself that you may be unaware of. Q. Wilhelm Reich discovered etheric matter many years ago but was rejected by society. Will this work be acknowledged in time to save the planet from the effects of nuclear radiation on the etheric planes? Will etheric matter be rediscovered? How will science find out about etheric pollution? A. In his experiments, Wilhelm Reich discovered what esotericists know as the higher levels of etheric matter. Reich was a scientist, not an esotericist. He was not looking for the etheric, but that was the result of the experiments. He saw that there is a primordial energy in every aspect of matter, whatever form it takes. He called it 'orgone'. Society did not reject Reich. Society did not know much about him. The US Food and Drug Administration rejected him. He was imprisoned for creating instruments, in this case boxes called 'orgone accumulators', purporting to store and use a 'non-existent' energy in a medical situation. To the Food and Drug officers orgone did not exist because they did not know about it. He knew about it from his experiments. Reich saw orgone as one plane of energy that is everywhere. I would call it the higher etheric levels of matter. There are four planes rather than one plane of energy. Reich was absolutely correct in his experimentation. There are many experiments which prove the existence of orgone. Reich offered to repeat those experiments before his accusers, the Food and Drug Administration, on condition that he would conduct the experiments, so there would be no tampering with the technology. The experiments are repeatable. He offered to conduct them and was rejected. Reich died in prison. He was a great man, totally unacknowledged, a second degree initiate when he died. Will his work be acknowledged in the future? I am sure it will. I made an orgone accumulator at home in 1948 and I know other people who have made them. I know of a man who made an orgone room or, rather, an 'esoteric room', in such a way that it attracts the energy from the four etheric planes. The orgone accumulator that I made attracts the fourth and third etheric. The levels attracted depend on the materials used. When in nature you find an underlying principle, whether by intuition or experiment, you realize how simple everything in nature really is. For example, the new Science of Light that will be given to humanity, when we have relinquished war and all the horrors of our modern economic and political systems, is basically simple. But we have to understand the principle. With that, the actual technical process is safe and relatively simple. Q. Would it be beneficial to take a homoeopathic remedy for radiation? Is there another antidote to help or are we stuck with it until we can get it out of our atmosphere? A. The Space People are doing their best within the karmic law to neutralize the effects of nuclear radiation. That is a tremendous help. The Masters also have the ways and means of neutralizing the effects of nuclear radiation, but until They are working openly in the world, They are not going to be much involved in that. There is already a liaison between our Masters and the Space People, especially from Mars and Venus. They are working out ways and means of neutralizing more radiation within the karmic law. At the moment they are conditioned by the karmic law. Ways and means open as the Space Brothers become more acceptable to humanity, as the idea of their presence grows, and they are seen to be really here and helping humanity. That is instead of being presented, as they are, by the governments, especially the US government, as totally degenerate, alien beasts who have their claws in humanity. It is a terrible calumny against the Space Brothers to whom we owe a great karmic debt. There is no remedy for radiation that I know but people whose bodies are affected by radiation can go to a homoeopath. It depends on the homoeopath. If you have a homoeopath who can make a particular vaccine for you that can be fed back to you, you could probably get rid of a large amount of the nuclear radiation. It can be done, but you have to be very clever in a homoeopathic sense and know what you are doing in an energetic sense. I do not know if such people exist in this country. There are probably remedies on the market that claim to neutralize nuclear radiation, but I do not know how accurate the claims are. I do not know the full answer to this question. But I know this will be discovered and developed in a mass sense. It is possible by homoeopathy to rid the body of the higher radiation that we are talking about. Q. Does it make a difference in our next incarnation if we have the experience of the Day of Declaration in this incarnation? A. How could it not? If the Day of Declaration is even remotely like what I understand it to be, we will be changed as never before in our lives. All of us, everyone on Earth, will be changed to some degree. Perhaps the absolute hard-edged fundamentalists of whatever religion will not be all that happy to have received the experience, and will perhaps not attach any great importance to it, but it will have changed them. No one can go through what they will experience on the Day of Declaration and not be changed in some way. People will be like children again. They will see the world as all children see the world, with the grace, the sense of joy, wonder and simple acceptance. But we are adults, not children. So a part of us will experience life anew but as children experience life, all wide-eyed, everything new, everything to be discovered, everything amazing, wonderful and pure, taking everything on trust. The sense of trust will grow in humanity for the first time in thousands of years. No one trusts life sufficiently. Everyone is hardened and feels they have to harden themselves because of commercialization, striving for a living in a place where only the market counts. The forces of the market are driving the world to destruction. You either go along with them or you fight them. Fighting them is hard, while remaining pure and simple and unaffected by the fight, unaffected by commercialization itself. It is so easy for people to say: “I agree. There should be justice in the world.” But given the chance to make a few more pounds or dollars, they will accept it if it comes along. Commercialization is so insidious. It touches on the greed of everyone who thinks they are without greed. It touches on competition in those who feel they are not competitive. There are probably few in America who are not competitive at base. You cannot be born and brought up in this country without being competitive. Competition is the bedrock on which your very manhood and womanhood depends. But it is not true. It is the opposite of the truth. You have been fed a great lie for the last 200 years. The lie of commercialization has coloured everyone's attitude to life, not only in America but in all those countries influenced by America. That is nearly everyone on Earth. This is the most influential country in the world today. Sadly, because its influence is bad. Co-operation is the nature of life for humanity. When man finds his true interior being as a soul, competition drops away of its own accord and, with it, the lie of commercialization, which Maitreya calls more dangerous to life than an atomic bomb. It is so insidious that it pulls at the worst aspects of humanity, the greed and selfishness. It is so easy to be corrupted by commercialization. People find service difficult because you can only serve properly when it is altruistic. If service is not altruistic, and not done from your own free will, it is not service. It has to be willingly, gladly undertaken because it is the right thing to do. Commercialization, with its competition and greed, selfishly walks over everything that stands in its way. If you have to win, if you have to be first in everything you do, you have a hell of a life ahead. You are striving and straining and living life at the edges of life, not at the centre of life. At the centre of life there is no competition. Every person is divine without exception. That divinity is expressed at different levels, but that is the only difference. Everyone is divine, everyone is needed, everyone is useful, everyone is worthwhile, everyone counts. So why the competition? Why do you have to be first, to get ahead, to win, and do all it takes to be first, get ahead and win? How could you be best in the world? If you run a race 0.6 seconds faster than someone else, you are the best runner, but so what? Competing in sport is fun. You can understand someone wanting to run or swim faster or win a medal. It is child's play, but playing like a child as an adult can be fun. But that is not what I mean by competition. Competition is that corroding need to be the best, to have the most, to be the cleverest, to know the most. It corrodes the heart. Q. If karma is so important in terms of families, what about adoption? Who should raise orphans? A. Orphans should only be adopted by those who have the capacity to give a child a stable background with a mother and father, the love which it needs, and the wisdom and lack of conditioning that most children hopefully receive from their parents. That is asking for the ideal. All people are conditioned because they are the children of people who are themselves conditioned by their parents. Parents pass on to their children their glamours, prejudices, hopes and fears. The children are brought up under the constraints of these fundamental fears and glamours of their parents. That goes for adopted children as well. The alternative for many adopted children is going to an orphanage, where they are usually one among a large group of similarly abandoned or neglected children. They are brought up together by people who often have very little love, very little opportunity even to learn how to look after children, and bring them up sanely and lovingly as they need to be. If it is a question of adoption into a family or living in an institution, nine times out of 10, I would say a family. With all its faults, the family is absolutely the best unit in which to bring up a child. In an adopted family there would not be the karmic situation that is usually there in a birth family. There would not be the ties and knots that have to be untied and resolved, which the family unit gives the opportunity to do. But in an adopted family there could be, and hopefully would be, the love, concern, and the trust that can be developed through love, and a sane uncompetitive treatment of the child. To be part of a larger family where there are two or three other children probably is the best situation. That provides most of what the child would need. It might be better to be alone with the parents, perhaps in the beginning, but not for long. To be part of a larger family that is already happy and established, and presents a wholesome view to the incomer who is loved and received openly by the children of the new family, would probably be the best. Q. Is there a relationship between: threefold education – physical, emotional and mental; honesty of mind, sincerity of spirit and detachment; and thinking, feeling and willing? Some schools are already trying to implement these things – schools based on the teachings of Sai Baba, Steiner, Krishnamurti. Your comments please? A. We have a threefold constitution. We are the monad, the divine spark, reflecting as the divine soul on its own level. We are the ensouled personality, however unaware we might be. Everything works out in threes. When we are at our highest, we are reflecting the spark of God, the divine, the spiritual. When we are nearly at our highest, we are reflecting the soul. It is the intermediary. If you are in right relation to the soul, you are in right relation to that of which the soul is a reflection. It is the same thing. On the physical personality level there may be a degree of contact with the soul, but none with the highest aspect, the monad, except through the soul, the intermediary. It acts as an intermediary for as long as it takes to bring its reflection, the human personality, into right relationship with the monad. Since we have a physical body, astral body and mental body, everything necessarily reflects through these three. Honesty of mind is obviously to do with the mind. Most people do not have honesty of mind. If we thought about our habitual use of the mind, we would find that as often as not we think one thing, say something else, and do something else again. There is no direct line from the thought to the deed. Sincerity of spirit relates to the sensitive, astral feeling body. Maitreya says the best way to think about this is to think of talking to some well-loved person, an associate or old friend whom you trust. You speak with that person honestly. You do not expect him or her to be indulgent of you. You do not try to put anything over on such a person, or try to get them to have a better view of you. You trust them to be open to you, to speak to you as you believe, think and feel yourself to be, heart-to-heart. Only two old friends can have a heart-to-heart talk, where they trust each other and accept the other as they are. Sincerity of spirit is obviously related to honesty of mind. They are not so very different. Detachment is the highest level, the detachment of the soul. The soul is detached. It does not want or need anything. It has only the desire to serve the Plan. The soul tries to influence and bring its reflection, the man or woman, into the position of serving the Plan. That takes what we would call a long time. From the soul's point of view, there is no time. It is an endless vista of eternity, so the soul is not in a hurry. But it tries constantly, life after life, to impress its vehicle to develop a growing detachment – from seeing oneself as the physical body; from dishonesty, therefore, of mind; from insincerity of spirit, from the glamour of needing to be loved, needing to be treated gently and indulged. If people are really detached, insincerity does not affect them. It can be a nuisance, but that kind of insincerity is simply the agitation in the core of the person. They are not detached in themselves. They want you to love them. People are always hungry for love. They want to belong. They want to be made to feel good. They want to be inspired. They want all these things. Fundamentally, if you are working at the soul level at all, you become more and more detached. That detachment is the highest; it is the aim. As you become more detached, you become more honest in mind, more sincere in spirit. As you become more honest in mind and more sincere in spirit, you become more detached. These three things work together. These are the three key things presented by Maitreya as the base of His teachings. If we only practised these three things to any real extent, we would do a lot. We would become so detached, honest and sincere in what we did and said that we would be halfway there by now! Q. Outside of practising a religion and our meditation, please give a few examples of how parents can educate their children to know, contact and give expression to the indwelling God. A. The absolutely best way is by example. You do not talk to your children about God. Young children do not know anything about God. They should be left to find God within themselves and to express their sense of it for themselves. You do not give them a thoughtform of God, nor do you give them meditations and set rules to bring the soul into manifestation. You teach by example. Children are sponges. They mop up what you present to them. You present yourself to them as all-knowing, all-suffering, patient, loving (in every way a doormat! ), then they accept it and will demonstrate their soul qualities. You have to be willing to completely devote yourself to the child or children. How many people can do that? They usually have jobs to do, and are busy and frightened themselves. You cannot help but pass on that fear and sense of rushing. No one has any time. They are dominated by this thing we call time. It is not the way to live. There is no time. It is only a convenience for catching planes and trains, and so on. But it is not for living, understanding, growing. If it takes a long time to do something worthwhile, it takes a long time. If it is worthwhile, it takes time. If it is not worthwhile, do not spend time on it. Give children your time, your devotion, your love, your readiness to answer every question. That is what a child needs. They need the example. You do not need to give them a religion. That is the worst thing to do. You do not need to give them a meditation. They are not ready for that. Give them your love. Q. Can you comment on the value of personal experience in the role of education – for example, the Day of Declaration? A. Nothing is as valuable as personal experience of whatever kind. The personal experience of the Day of Declaration will be extraordinarily transforming. People will feel transformed. For a few weeks perhaps they will feel and behave differently. They will like each other. They will say 'Hello' in the street. Experience is the best of all things. You know from experience better in every way than anything you hear from someone else. Your experience tells you this is so. No one can take that away from you. I know the Christ is in the world because I have experienced it. When I talk about it, I present it for consideration, but I know it. That is why I can talk about it with conviction. It is part of my experience. Anything that is the result of experience will be altogether more transforming than something you hear about from someone else. China and several European countries have experienced protests, and in some cases riots, due to worsening economic conditions resulting from the global financial crisis. In Iceland, Prime Minister Geir Haarde's government resigned on 26 January 2009 following months of increasingly violent protests over the impact of the global economic crisis. Thousands of people lost their savings and jobs after the country's once-thriving financial sector collapsed in October 2008, with the government forced to nationalize its major banks as the value of the country's currency dropped dramatically. Over 10,000 people gathered in Latvia's capital, Riga, on 13 January 2009 to demand that the government resign for accepting an International Monetary Fund (IMF) loan in return for “structural reforms”. The demonstrators protested against rising unemployment and wage and budget cuts, combined with tax increases mandated by the IMF in exchange for the loan. The peaceful protest turned violent at the end of the evening, as hundreds of young people, many recently unemployed, rampaged through the city. Latvia had double-digit economic growth in recent years, but its GDP is forecast to contract by 5 per cent in 2009. In the Lithuanian capital, Vilnius, a protest against government economic policies by 7,000 people on 16 January became violent. Protestors attacked the Lithuanian parliament building with stones and eggs, and called on the government to resign. Police dispersed the crowds with tear gas and rubber-tipped bullets. More than 80 people were arrested. Organized by the Lithuanian Trade Union Confederation, the protest condemned public sector wage cuts and increases in taxes designed to help the country's faltering economy. Thousands of people held rallies across Russia on 31 January, protesting against the government's mismanagement of the economy. The largest demonstration took place in the eastern city of Vladivostok, where protesters demanded the resignation of Prime Minister Vladimir Putin. “Anti-government protests were unthinkable just a few months ago as the economy boomed with record high oil prices and as the Kremlin tightened its grip over almost all aspects of society,” according to a BBC report. “But now with the economy in deep trouble, there is real fear among ordinary people about what the future will hold.” Unemployment is rising quickly in Russia, as are the prices of basic foods and utilities. On 29 January, an estimated 1.5 million people in a dozen French cities protested against the government's handling of the economy. In the largest demonstrations seen in France for more than a decade, people took to the streets demanding more protection for jobs and wages, and that the government do more to deal with the country's growing economic crisis. Unemployment in France is increasing at the highest rate in 15 years, consumer spending has fallen dramatically, and leading labour unions, which organized the nationwide protest, say the economic stimulus package announced by President Sarkozy is totally inadequate. In one week in December, 2,000 workers at a Singapore-owned firm in Shanghai protested over wages; thousands of farmers held 12 days of mass demonstrations outside Shanghai; along the coastal area angry workers besieged government buildings after local Hong Kong, Taiwan,and South Korean owned factories closed their doors without paying wages; in southern China, hundreds of workers held a protest against pay cuts imposed by managers, blocking a local highway; at several factories chaotic scenes were witnessed as police were called in to stop creditors breaking in to seize equipment in lieu of debts; in northern China, television journalists were punished for reporting a story of an occupation staged by 6,000 workers at a textile mill; in January 2009, on the streets of Yangjiang, around 1,000 teachers demanding their wages from the local authorities confronted police; in the city of Dongguan, battles took place between striking workers and security guards at a textile factory; in Shenzhen, about 100 auxiliary security officers, known in Chinese as Bao An, staged a protest after they were sacked by a state-owned firm. The American economist Nouriel Roubini said that growth figures masked the reality that China was already in recession. DEC (The UK Disasters Emergency Committee which represents 14 charities) launched an appeal with the aid of UK independent television channels, raising £3 million in one week. Supplies of food, drugs and blankets reached almost 800,000 Palestinians. “More public funds are needed so that we can continue our aid efforts,” said Brendan Gormley of DEC.
On 14 February 2009, a convoy of humanitarian aid started off from London to travel through France, Spain, Morocco, Algeria, Tunisia, Libya, Egypt and through Rafah and into Gaza. “People have felt helpless in the face of the suffering shown on the TV,” a spokesman commented. We present a selection of quotations on the theme of 'Maitreya's first interview' from Maitreya (Messages from Maitreya the Christ, and Maitreya's Teachings – The Laws of Life), Benjamin Creme's Master (A Master Speaks), and Benjamin Creme's writings. This present 'time' should be seen by men as the anteroom in which Maitreya patiently awaits the signal to emerge onto the world stage. The present chaotic conditions, especially in the economic and financial fields, have tipped the scales and made possible a decision on a period which men themselves would welcome as 'soon'. It will not be long, therefore, until the Great Lord begins His open mission, albeit undeclared. Watch and wait with a sure understanding of His priorities, and so miss Him not. When the stock market does collapse, as soon as it is obvious that it is on its final plunge, Maitreya will emerge. He will take up an invitation that He has received to appear on a major television network in the US, then in Japan. After that, all the networks will want to interview this extraordinary man. He will not be called Maitreya. He will not be introduced as the Christ or World Teacher, but simply as a man among men, one of extraordinary potency, wisdom, obvious love and concern for the people of the world — not just one group but all people wherever they are, whoever they are, at whatever level. They will listen to Him. His voice will be heard. He will reflect the need of the majority of the human race for justice and freedom, for the right to live decent lives which most of us in the West take for granted, knowing where their next meal is coming from, with work and the joy of bringing up their children without seeing them dying in front of their eyes. When enough people are thus responding to His message, they will demand that the networks of the world allow Him to speak and develop His ideas more fully to the vast majority. Then the television networks will be linked together by satellite. This will be the most extraordinary event of all our lives, the most extraordinary event in history, like none other before it in its scope. In starting His open mission, the Great Lord must tread carefully, not to frighten away those He seeks to help. Therefore, a quiet note, but heartfelt, should be looked for. In time, a greater urgency and force of statement will be appropriate, and trenchant, indeed, will be His call to men. Expect, therefore, a growing emphasis, a sterner warning, from Maitreya's lips. As time proceeds, His thoughts will find response of differing kind. Those more traditionalist will find many of His ideas difficult to embrace, and will denounce them in strident terms. Others, less hidebound, will consider and appraise them, and from this group will He find many who will gladly espouse His cause. In growing numbers, they will gravitate to Him and lend their voice to His counsel. Proceeding thus, Maitreya's teaching will draw forth from men their highest aspiration, awakening them to the troubles and perils of this time; and also to the simple means of conquering for ever the problems and dangers of today. Thus will it be. Thus will men receive the insight and the leadership they yearn for, and thus will they call for the changes so sorely needed to the fabric of men's lives. Of course, it is only to be expected that many will oppose the teaching of the Great Lord. Religious groups, deeply embedded in their own doctrines and expectations, will strongly disavow Maitreya's presence and ideas, and many unpleasant accusations will be directed towards Him. Nevertheless, many will be inspired and renewed in faith, and will give of their best for Maitreya's Cause. The business conglomerate, so highly invested in today's crumbling structures, will react in one of two ways: those who see Maitreya as the enemy of all they stand for will oppose and thwart His counsel to their utmost effort. Those who see Him as the voice of the future, as the only possible way for men, will welcome and espouse His ideas, and lend their expertise to His growing support. Thus will the factions act and take their stand: for or against the future, the only way open to men. When you see Me you will know that the time for action has come, for I count on you, My friends, to act in implementing My Plan. For many of you, this is an old and well-known mode of life; you are servers come to serve your brothers. It is as such that I shall call on you, and I value highly your help. Without that willing help My Mission would be a burden indeed. Now that I am among you, I have discovered even more keenly that mankind is ready to share. Within all those who hear Me I see the burning light of Justice and Truth. I voice simply their desire, and thus evoke that Truth. So will it be with you, My friends, for even as I speak I see shining within you this Divine Light. Let it shine brightly forth, My dear friends, and show the way for your brothers. Maitreya is awaiting the best timing to go public. He is waiting for the best opportunity, that is timing, in which there will be the best and quickest acceptance of what He has to say. There is still an enormous body of people in the world who do not want anything to do with Maitreya or His ideas. All the religious groups have their own fundamentalists who together make a huge block. Think of the fundamentalist Christians, the fundamentalist Muslims, the fundamentalist Jews, Hindus now, even Buddhists to some extent. It is a huge number of people, and they have to come to grips with this reality. They will not see Him as the Christ or the Imam Mahdi, not at first. The best timing is when the crumbling economic system is bringing the West to its knees economically, and bringing it into reality for the first time. We have lived in unreality for so long. We think, and our leaders think, that we can go on in the old ways, exactly as we have done — more competition, more greed, more of the same, and it will just go on, we will win. It is not so any longer; it does not work. When Maitreya comes on major television, why will He not use His own name?